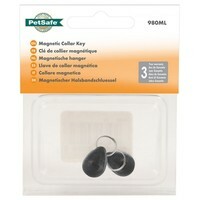 The Petsafe Staywell Magnetic Collar Key 980ML is for use with the 400 and 900 series of Petsafe Staywell Magnetic Cat Flaps. The keys can be attached easily to your cat’s existing collar and will allow multiple pets to use the same magnetic cat flaps. They can also be used to replace your cat’s current key if lost or damaged.